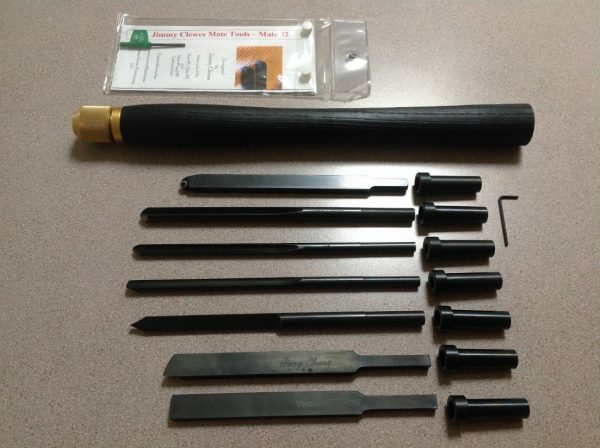 This is a high Quality very versatile, complete beginners to intermediate set of Tools. All the tools will fit into the Ash Scorched hand turned handle with the 5/8 Quick release unit. All you will ever have to do is replace the blades. All the tools are made by Doug Thompson except the Mate # Tools. Tools are sharpened and ready for immediate use. NOTE: A 3/4 inch Spindle Roughing out Gouge is NOT supplied in this set. This standard forged gouge can be bought from many Woodturning supply outlets. Free T-shirt with order and Free Mini Mate with each order. Please let me know your T size.